Our range of products include embroidered new design sarees, bridal princess designer sarees, beautiful fancy partywear design sarees, crepe designer work beauty sarees, simple white designer stylish sarees and beauty embroidered fabric georgette designer sarees. Our company deals in a quality range of Indian Designer Sarees. These Designer Sarees are available in various unique prints, they are also soft and comfortable to wear and can easily lure anyone. In addition to this, clients can avail these products from us in various alluring designs, colors, sizes and styles as per the individual preferences of clients. We greet you to explore a cultural collection of printed designer saree. These Designer Sarees are available in various unique prints, they are also soft and comfortable to wear and can easily lure anyone. In addition to this, clients can avail these products from us in various alluring designs, colors, sizes and styles as per the individual preferences of clients. We are engaged in offering a beautiful collection of designer sarees. These are designed in compliance with the international quality standards to fulfill the varied needs of our esteemed clients. Available in different sizes, colors and patterns, these sarees are highly demanded for their fine texture across the country. In addition, this Pink Saree is suitable to be worn on all types of occasions and can be availed at cost-effective prices. Our company is among the very well known companies in the field of manufacturing, supplying, wholesaling and exporting Party Wear Saree. We have superb quality collections of party wear saree. These products are designed beautifully under the expertise of our professionals. The offered products are available in different colors and designs. The Net Embroidery Sarees exported by us are in line with the latest fashion trends. These are widely appreciated all across the globe owing to the elaborate embroideries and exclusive designs. Our artistic designers utilize supreme grade fabrics in the designing and stitching processes of these products to ensure that these are unmatched in quality, durability and finish. In addition to this, clients can avail these products from us in various alluring designs, colors, sizes and styles as per the individual preferences of clients. We are one of the leading manufacturer, supplier, and exporter of wide range of a Indian bollywood designer wedding sarees. 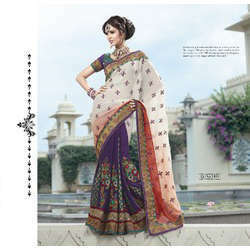 outstanding cream white and dark violet saree is invented on net with glowing sequins work and embroidered patch border. Magical body is festooned with sparkling sequins, stones, resham embroidered floral creeper motifs and scattered green color patch are very well done on it. This timeless beauty will surely be the talk of town. Looking for “Hand Embroidered Sarees”?